I've been a journalist for 20+ years. I've spent my career identifying newsworthy stories, turning them into great copy, getting them published and reaching a wide audience. 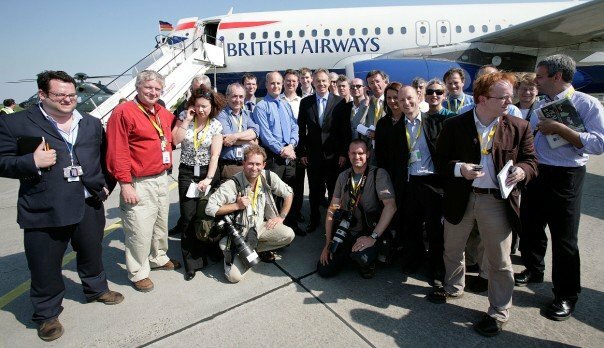 I'm a former member of the Downing Street press corps and I've worked in newsrooms including Reuters, Bloomberg and the Guardian. As a freelance journalist, I've successfully placed stories with TIME, The Daily Mail, The Sunday Times, the Guardian, Red, Psychologies and Easy Living. I blog regularly for The Huffington Post. I've been interviewed on Newsnight, Sky News, ITV breakfast television and BBC Radio 4. I published my first book in 2017. I use my media skills and experience to help others get their message out into the world and create a buzz around their business or brand. Flying with Tony Blair as a political correspondent for Thomson Reuters. Press conferences and cocktails at Downing Street. Traditional PR, from my experience, is overly focused on press releases. Journalists and editors want news stories and features that connect with their audiences. Depending on the medium, they either want clear, concise, timely email pitches that explain the relevance of stories to their readers, listeners or viewers, or they want entire stories written and edited to publication standard. As someone who has pitched to editors on newspapers, magazines and broadcast media and who has worked in a variety of newsrooms, I can show you how to master both these approaches so your business, brand or charity makes a splash. Educated at Oxford University, with a degree in French & Spanish, I've worked for some of the world's leading news agencies, newspapers and magazines and I've reported on some of the biggest news stories in recent history. As a political correspondent for Thomson Reuters based in the Houses of Parliament, I covered Tony Blair's decision to join the war in Iraq, the election of Gordon Brown and numerous party conferences. I reported on the 2004 Asian tsunami from Sri Lanka, the 2010 earthquake in Haiti and the London bombings of 7/7. I also spent nine years living and working in Mexico and Brazil as a foreign correspondent. Since turning freelance in 2008, I've trained journalists around the world for the Thomson Reuters Foundation, teaching them how to write stronger, more accurate news stories that will be more widely read, and I've written articles for national newspapers and magazines. I have lectured on the Masters in Multimedia Journalism at Bournemouth University and at City University's journalism school. I regularly connect with exciting businesses and inspiring entrepreneurs who have a great story that deserves to be told. I have the skills, ability, knowledge and experience to help those stories get great media coverage and to turn dull website content into scintillating copy. I am passionate about good writing. I'm also an eagle-eyed proof reader and have the ability and experience to identify newsworthy stories and know where to pitch them. I am an excellent communicator, with a knack for turning complex ideas into easily digestible and readable copy. I've been doing this a very long time! I offer a number of services: PR Coaching & Consultancy; Content Creation; Writing Coaching; Ghost Writing. My goal is to equip you to own your own PR. I work with clients, either 1-on-1, in group workshops or in-house in PR and marketing agencies, to brainstorm the most newsworthy aspects of a business, brand or charity, to identify target media and to draft email pitches or write full-length stories. I identify which journalists to contact, explain how and work with you every step of the way as you approach editors and get your story out into the world. I can also help you get noticed by appearing on radio and TV as a commentator or by writing comment pieces and blogs in the press. I don't do your PR for you because, as the owner of your business, you're better equipped than anyone else to get your message across. You know your story. You have the passion. I'm here to share my industry knowledge, experience and contacts and to smooth the way. I help you create great copy for your website, blogs or marketing and advertising materials so that you can connect to your clients on a deep, emotional level and have a real impact. I wrote and published my first non-fiction book in five weeks in early 2017, after several years of procrastination. I can help you write yours. A book is an excellent calling card. It gives you credibility and helps you connect with a much wider audience. If you have a non-fiction book idea, I can help you knock it into shape. First, I'll help you identify your 'why' - your passion, purpose and objective. Next, we'll sort through your ideas and material, divide content into chapters and devise a writing schedule that works for you. I can provide accountability and support throughout the process, as well as advice on publishing options - traditional or self-publishing - attracting an agent and approaching publishers. I'd love to write your blog or book for you, while you get on with what you do best. Get in touch and I can explain how I work.